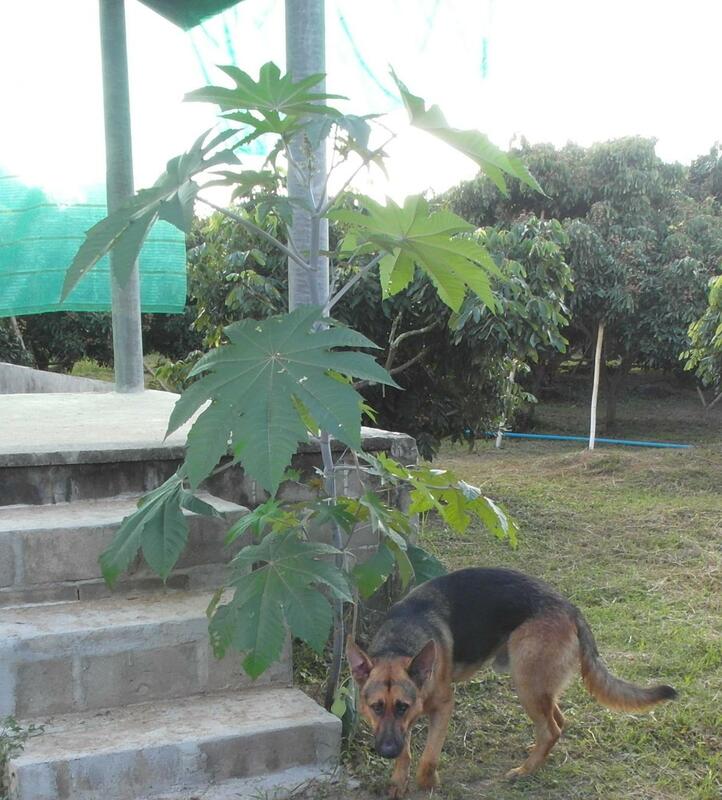 This plant appeared about 2 months ago in our land and grew in that time to a size of more than 2 m.
It looks interesting so I would like to keep it, even grow some more of those. The problem is I am not sure what kind of plant it is. If it is a giant hogweed I would have to destroy it. I looked it up in the internet (Heracleum mantegazzianum) but the photoes look a bit different. I hope somebody can help me and tell what kind of plant it is and may be what it's good for exept looking nice. 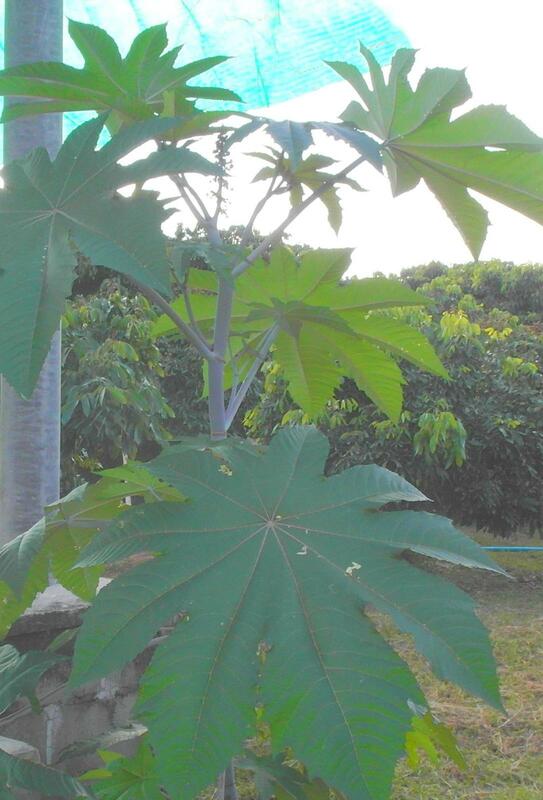 hey there.. if i am not mistaken.. its a Papaya Tree! 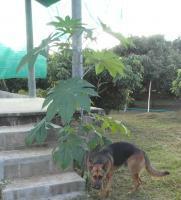 We have papaya trees, too. The photo is not very good, I took it in the evening. May be I have to take another one. For now I'm adding a detail. It's a papaya. They're normally flowering by this stage. Try feeding it. Thank you so much for this report. It helped. Seems it's not hogweed, looks more like the cow parsnip. Only the flower looks different from both the hogweed and the parsnip. May be the flower is still in an early stage. Same 10 petal leaf pattern. 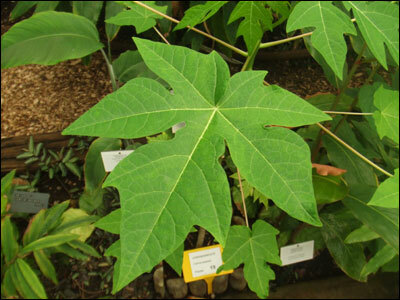 A Papaya leaf is maybe different? Now I think so, too. The flower looks the same. You can see it in my pictures. And I am worried about the dogs. So I will probably remove it. Here is a guide as to how to remove it. I know it from Australia ... I didn't know it was in the USA. Last time I was in Hawaii(12 years ago or so) it was becoming invasive... I remember people talking about it...it was growing and taking over native plants.. 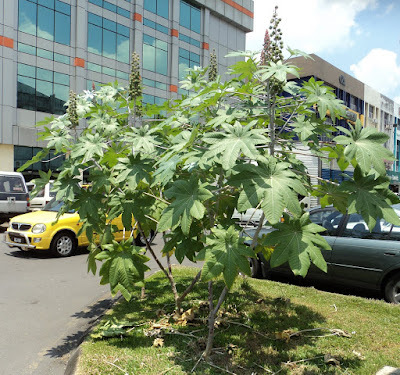 Yes it is Caster oil plant ( or Ricinus Communis ) . Get rid of it and make sure it does not seed as they are a real pest and extremely dangerous/poisonous . Attractive, yes. Desirable , no. You are all completely correct. We removed it today. The garderner told me there are many of those at the banks of the nearby river. Makes sense.